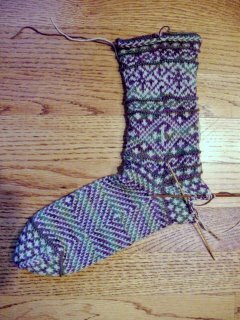 From the Six Sox KAL, the Iris Garden sock, knit in white Opal and, appropriately, Purple Iris Lorna's Laces! I've had the ya rn forever after buying it because I love iris. But I just knew it would pool and have been trying to find an appropriate pattern for it, and this will do. That is pooling going on in the foot - not stripes. 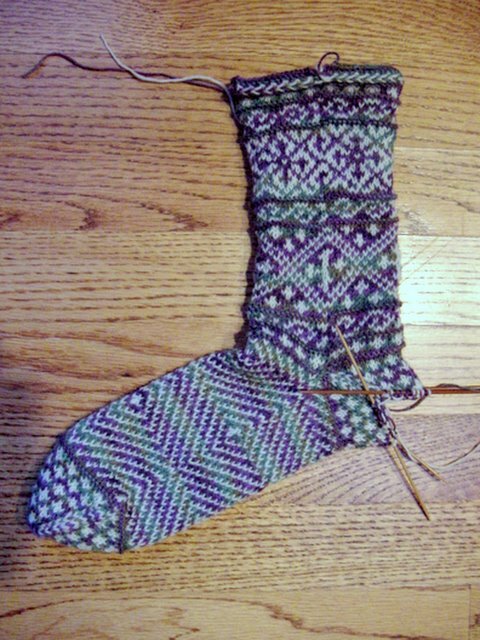 Knit with #1 dpns toe up and afterthought heel. Notice the braid around the top edge. Quite a lovely pattern indeed.